This was a convincing and complex plot with several unexpected twists and turns and which introduced me to DI Marnie Rome and her partner DS Noah Jake. This is the fifth novel in the Marnie Rome series but reads like a standalone thriller. 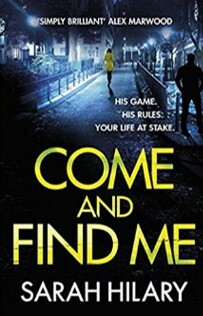 Come and Find Me is a gritty, police procedural and opens from the first person narrative of HMP Cloverton inmate Ted Elms. He describes an extremely violent and bloody riot in the prison as he lies in hospital on life support. The novel dips in and out of first and third person, which can often feel like an author having their cake and eating it - but here it works well. In the aftermath of the riot, the prison authorities discover that a violent and manipulative inmate, Michael Volky, has managed to escape; so it is not long before Marnie and Noah are both on his trail. Events take place roughly six-weeks after their last major case and both Marnie and Noah have their own personal traumas to deal with, as they head off to search Volky’s family home in Ealing for clues to where he might be. Marnie’s foster brother, Stephen, is also in Cloverton (for murdering her parents) and is badly injured from the prison riot. Stephen he has refused to tell Marnie the reason for the murders and she is desperate for answers. Meanwhile, Noah has his own family issues; disowned for arresting his brother Sol (on gang related offences). Slowly Marnie and Noah begin to piece together Volky’s life in and out of prison, including the two women who wrote to him, Lara Chorley and Ruth Hull, his sister Alyson and a hero-worshipping young prison guard called Dan ‘Dazza’ Quayle. Then there are his cellmates, Ted Elms who had reason to hate and fear him, and Charlie Lamb who hanged himself in the cell that they shared. Throughout the proceedings, Volky remains a diffuse figure, described as a phantom, a shadow. One character describes him as ‘like smoke, always shifting, never in focus’ but he had a talent for art and the walls of his family home are covered with his photos and drawings. Images feature heavily in the plot. Volky uses his drawings to capture and hold his victims almost as trophies. Photos also can tell a different story as Marnie is asked by her brother Stephen to look at family photos of him and her parents and in so doing she realizes that, underneath the smiles, there was a very different family dynamic going on. This thriller deploys an intricate and faultless plot structure, which kept me guessing right up to the end, and Hilary confidently (and elegantly) handles her cast of characters solidly as they hunt down Volky. Marnie is an engaging character conflicted by her growing attraction to a colleague, DS Harry Kennedy, whose mother is in the early stages of dementia; and then the final twist which I wasn’t expecting and made me look back to see if I’d missed the signs - as Marnie finally gets the answers to her questions.